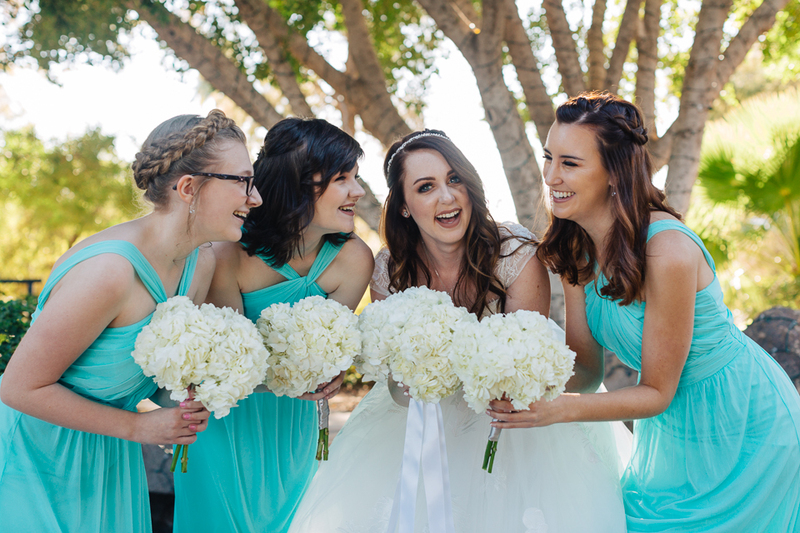 I just can’t get enough of this fun filled Val Vista Lakes wedding with Jenn and Shawn. These two were absolute rock stars at their wedding!!! When you first meet Jenn and Shawn you feel like you have known them all your life. They are such genuine people that you can’t help but feel great when you are around them. After photographing their engagement session in the Roosevelt Row Arts District I knew their wedding would be special. Jenn and Shawn had chosen Val Vista Lakes for their wedding venue. With it’s lake views and the Superstition Mountains off in the distance you can see that it was an awesome choice. Upon arriving Jenn was in the final stages of getting ready. Hair and makeup were complete with the last steps of getting into her Franssical wedding dress. These moments are always so special with mom and bridesmaids pitching in to finish those touches of making the bride a princess. While Jenn was getting those final touches Shawn was prepping for his big day as well. One of the coolest things about this wedding, at least in my humble opinion, was the choice for best man. Shawn chose his sister Kristen to be the best man. How cool is that! Seeing this brother-sister duo together it came as no surprise Kristen was best man. With our gorgeous couple prepped and ready it was time for the ceremony. If having your sister as the best man isn’t cool enough, Jenn had both her mom and step-mom walk down the aisle together. Jenn’s bouquet was actually split into two separate smaller bouquets so that each mother could carry one. Amazing! As our bride made her way down the aisle she looked stunning. When she met with both moms, they tied their bouquets together to make one for Jenn. One of the sweetest things I’ve witnessed at a ceremony. After the ceremony the marriage license was signed to make it official. We then snuck off to take some formals of our married couple. Mother Nature gave us some nice light and these two crushed it!! They made their grand entrance and later were toasted by the best man and maid of honor. Thank you speeches by the mother of the bride and Jenn herself lead into the reception dancing. What an amazing night as these two danced the night away. Below you will find a few more of some of my favorite images from the wedding. I’d like to close with saying “thank you” to Jenn and Shawn for allowing me to capture their Val Vista Lakes wedding. It was such an honor to be a part of something this special. I couldn’t have pulled this off without my second photographer, Matt who always rocks it. And finally every wedding is the creation of an amazing team. Below are the creatives who made this day nothing but awesome.